The National Rifle Association put Ku Klux Klan hoods on Thomas the Tank Engine to criticize the show for adding more diversity, sparking outrage on Twitter. Thomas & Friends is shown in 161 countries and territories, and over 500 episodes have been produced. But the show has never left the island Sodor and has had very few female characters since it debuted. To fix that, producers are introducing Nia and Rebecca. Nia was a character developed with the United Nations and will be voiced by Kenyan-born English actress Yvonne Grundy. "We've always had female characters but bringing them to the forefront of the show is really important. … Having that real kind of range and diversity is important so that everyone can watch the show and think: that person is like me, that character is like me, and feel represented," producer Micela Winter told CBS This Morning on Sept. 8. During a segment on her NRA TV show Relentless, NRA spokeswoman Dana Loesch lashed out at the producers of Thomas & Friends for their plans. 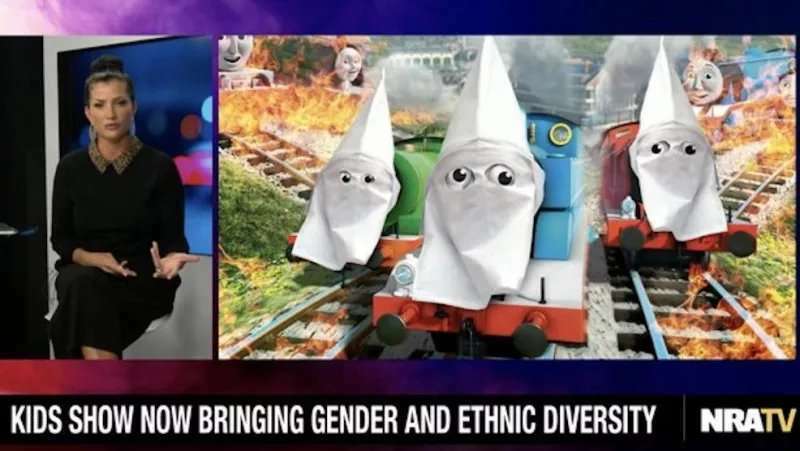 At one point, Loesch showed a graphic of white hoods on the beloved Thomas the Tank Engine characters. "Thomas the Tank is now bringing gender balance to the show by adding girl trains. Seriously," Loesch said, reports Media Matters. "One of those trains, Nia, will be from Kenya to add ethnic diversity to the show. And -- which that by the way, that’s where it gets really strange to me because I’ve looked at Thomas and Friends, at their pictures, and I see gray and blue. Am I to understand this entire time that Thomas and his trains were white? Because they all have gray faces. How do you bring ethnic diversity? I mean they had to paint, what I guess they thought was some sort of African pattern on the side of Nia’s engine? How do you bring ethnic diversity to a show that literally has no ethnicities because they're trains." Loesch later added sarcastically, "Fair. I get it. Thomas the Tank Engine has been a blight on race relations for far too long. Clearly this is overdue. Right?" The segment sparked anger and puzzlement on Twitter, wondering what the point was of putting Thomas characters in KKK hoods. "This is the NRA’s totally reasonable, super clever, and not a little bit racist response to a Nigerian train character being introduced," one person wrote. "Because... that character existing means...Thomas was in the KKK before? Or something? Ok, I give up. This is disturbing as hell." "The NRA literally has gone off the...rails," George Takei wrote. "Such a hateful nightmare they are. We are all so exhausted by dumb, vicious people. Vote in November. Let’s enjoy ending this nightmare," Judd Apatow added. "What is wrong with this woman?" added another Twitter user. "Remember when I said getting outraged over Thomas and Friends being diverse is peak outrage over reboots, this is exactly what I meant. Congrats NRA, especially Dana Loesch, you are kings and queens of the morons. Outraged over a preschool franchise," added another Twitter user. In response to the NRA TV ad, Mattel, which owns the Thomas characters, told the New York Times they have always made promoting kindness and diversity a "priority." “We are not associated with images that promote hate and denounce any images of our brands that are being used to convey a message not in line with the values of the company," the company said.